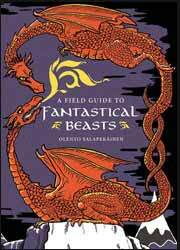 A Field Guide to Fantastical Beasts is a full colour hardback book by Olento Salaperainen - an expert on mythological and legendary creatures - who resides on the Shetland islands. Each monster has its own illustration by Andrew Pinder. It has 187 pages and is published by Apple Press, of London. I have no idea why this would be called a ‘Field Guide’ when it describes mythological beings. You could hardly carry it around just in case you come across one of them! This book is beautifully laid-out, with lavish artwork on one page and the descriptive text on the opposite. The front cover has a very Chinese feel, with linking dragons and a Chinese-style font – not surprising, considering the book was actually printed in the East. Where the recently reviewed How to Keep a Werewolf… failed, this book positively succeeds by incorporating explanations of origins, visual and characteristic descriptions, and a brief story of how they proved troublesome to people. The book separately examines fifty creatures falling under one of the headings Fairies & Little People, Demons & the Undead, Water Creatures, Hybrid Beasts, Humanoid Creatures, and The Sacred & The Divine. This is quite a comprehensive reference book, without ever becoming boring or bogged-down in explanation. It is also a works that can be easily dipped in and out of.